In our interconnected world a power outage is particularly frustrating. But if you have an electric power station on hand, then you never have to worry about dead cellphones or gadgets again. Large capacity batteries are becoming more affordable and more efficient. It’s gotten to the point that a shoe-box sized electric power station can, in the right contexts that is, give you more mileage than a loud, gas powered generator. And you could use a power station to go off the grid for awhile, you’d just have to pair it with some solar panels. It’ll be a long while before you can toss out the gas generator at your cabin and replace it a backpack friendly power station, of course, but the current generation of power stations are pretty amazing and you can easily stay juiced up at a remote campsite for days and weather minor power outages with your cellphone and laptop still going strong. But there’s a lot to take into account before buying a power station. 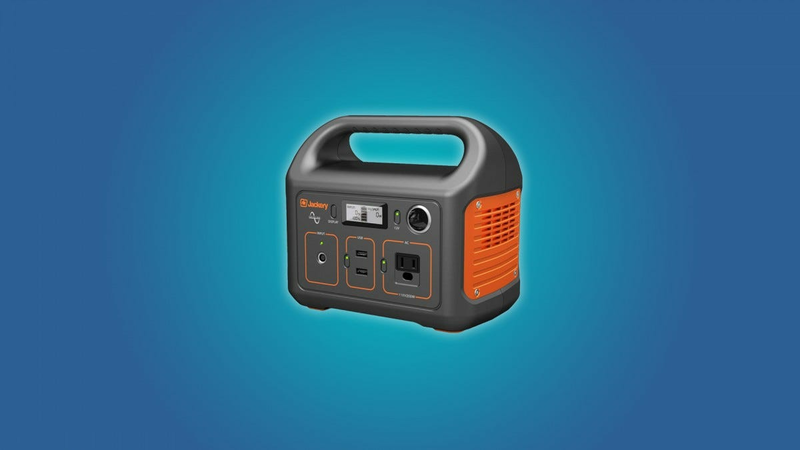 If you want a power station for outdoor or auto work, then you should find one that has a large capacity and a lot of AC or DC ports. But if you’re just looking for something to charge a couple of phones on a camping trip, then you’ll want to focus on portability and USB ports. Luckily, we’ve done the research for you. 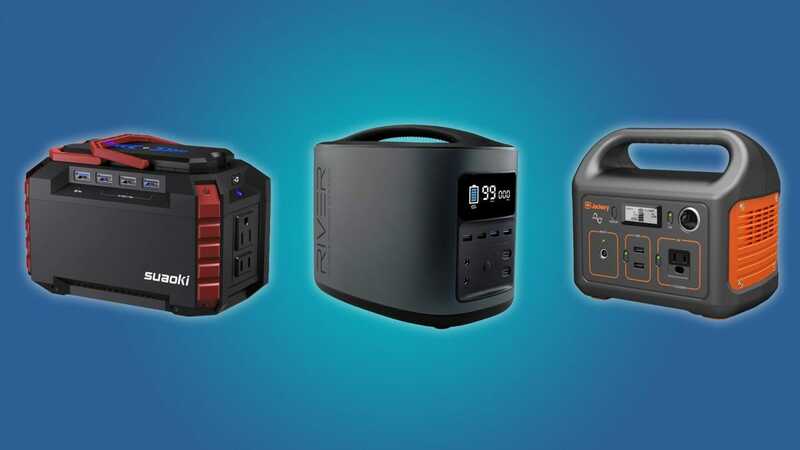 Here’s our favorite power stations to keep the juice flowing whether you’re in the deep woods, deep under the snow in a power outage, or deep into a serious job at the worksite. 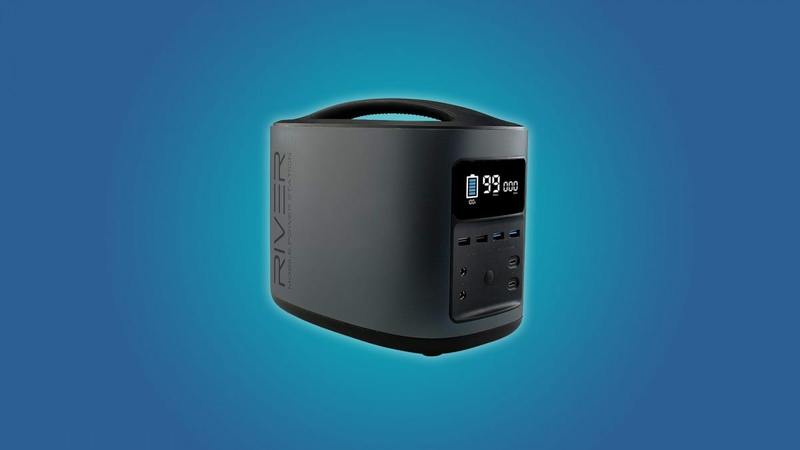 If you’re looking for a large capacity power station that can charge multiple devices during a camping trip or power outage, then you should take a look at the EcoFlow River. We’ve raved about the EcoFlow River before—it has a capacity of 412Wh, which means that you should be able to power TV or lights for a couple of days. Or, if you want to blow through those 412Wh a little bit faster, then you can use the EcoFlow River to power up to 11 devices at a time. The River has 2 USB Quickcharge inputs, 2 regular USB inputs, 2 USB-C inputs, 2 AC outlets, 2 DC outlets, and a 12V car port input. That’s quite a few ports and significantly more than you’ll find on most power stations. If you need some extra juice, then you can extend the life of this power station by pairing it with an EcoFlow solar panel. But really, 412Wh is more than enough power. The only real downside to this device is that it’s pretty expensive. And if you’re just trying to charge a couple of phones on a camping trip, this power station may be a little overkill. Some power stations can be a little bulky, especially if they have a lot of inputs. But the Suaoki power station is about half the size of a shoebox and it power up to 10 devices at a time. This power station has 1 quick charge USB input, 3 regular USB inputs, 2 AC ports, 4 DC ports. It also has a set of built-in lights, so you can use it as a lantern (with a giant battery!) in a pinch. 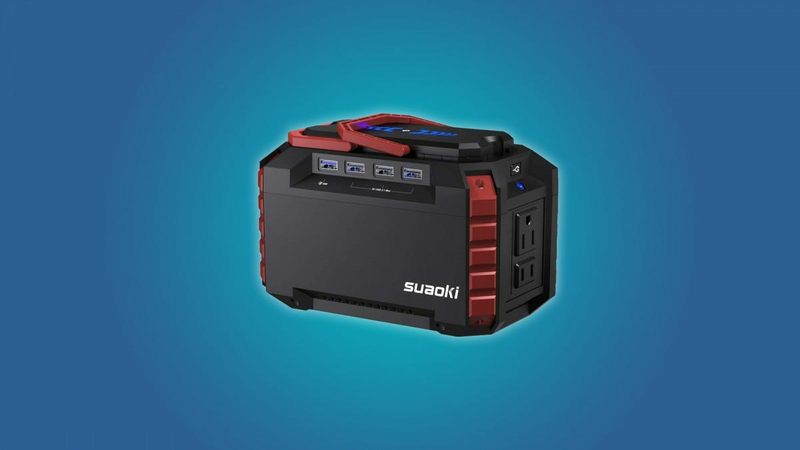 The Suaoki can power a lot of devices at once, but it only has a 150Wh capacity, so you can’t expect it to run TV’s and laptops for days at a time. Really, this device is best for powering devices like fans or lights, or for charging phones and laptops. You can pair the Suaoki with some solar panels to extend its life, which is a pretty good idea if you’re trying to stay off the grid for a couple of days. If you’re looking for a strong, mid-range power station, then you should consider the Jackery power station. It has a capacity of 240Wh, which is more than enough power to keep a TV or a Mini Fridge going for a day. The Jackery only has two USB inputs, one AC port, and one DC port. If you need a power station that can get your family through a long power-outage, then you may want to shell out for a power station that has more power inputs, like the aforementioned EcoFlow River or upgrade to the $500 440Wh Jackery model. 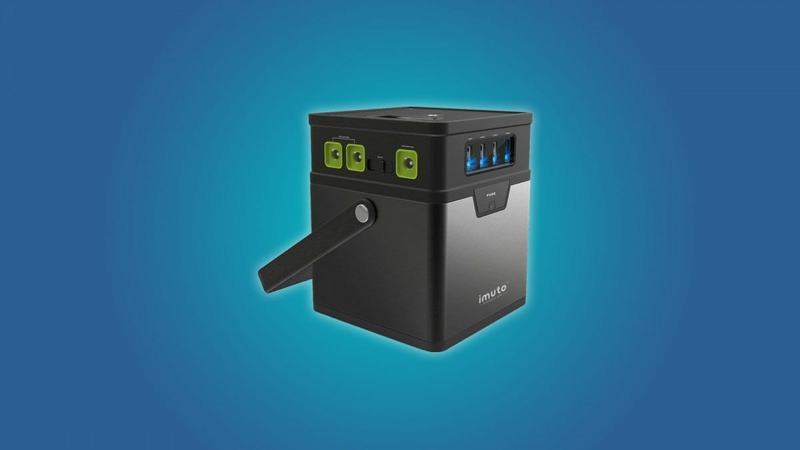 But if you only need a power station for personal use, then the 240Wh Jackery is a perfect choice. Like other power stations, you can pair it with a solar panel. In fact, they have a 50w solar panel that’s built specifically for the Jackery power station. Sometimes you’re more worried about charging your car battery than your phone battery. 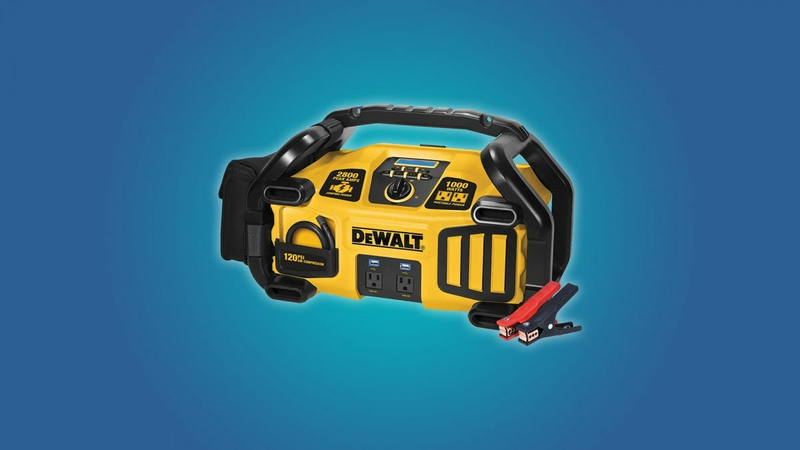 The DeWALT professional power station is designed for car maintenance and emergencies. It comes with a pair of alligator clamps to jump your car battery, an air compressor to re-inflate your tires, and a set of bright work-lights to help you see what you’re doing. Of course, the DeWALT also has two AC inputs and two USB inputs, so you can use it to power devices or to charge your phone in a pinch. This is a relatively affordable device, and it can be used for all kinds of purposes. But it only has two AC inputs and two USB inputs, so it can be hard to share with a family during a power outage or camping trip. You can get some extra life of this power station by charging it with a solar panel, or by passively charging it with your car’s cigarette lighter while you drive around. Just keep in mind that those cigarette lighters tend to charge things very slowly. If you want the smallest, most affordable power station, then you ought to take a peek at the imuto power station. It’s a little bit bigger than a can of soda, but it has a pretty large capacity of 182Wh, and it can power up to 7 devices at a time. The imuto has 3 DC ports, 3 regular USB ports, and 1 quick charge USB port. It doesn’t have an AC port, but you can use a first-party power inverter for devices up to 100w, if you really need one. But to be honest, this power station is best with laptops and cell phones. You’re not going to run a mini fridge off this thing, but you will be able to charge up a pile of portable devices. If a power station the size of a soda can appeals to you (and everything is more appealing when referenced in soda cans as a unit of measurement) it’s tough to say no to the imuto. It’s pretty affordable, and you can always pair it with a imuto solar panel to get some extra battery life. You don’t need to throw out your good old speakers to add streaming audio to setup. All you need is a streaming audio device. They’re easy to use, and they’re not too expensive. Amazon’s Fire Tablets offer some of the best bang for your buck you can get in a tablet today, but there are more differences to these tablets than just the size. Here’s a breakdown of what you get with each.